The all-new Volkswagen Tiguan has gone on sale. The SUV is available from £25,530 and can be specified with petrol or diesel engines, along with the option of two-wheel or four-wheel drive. UK deliveries are expected to start in the summer. 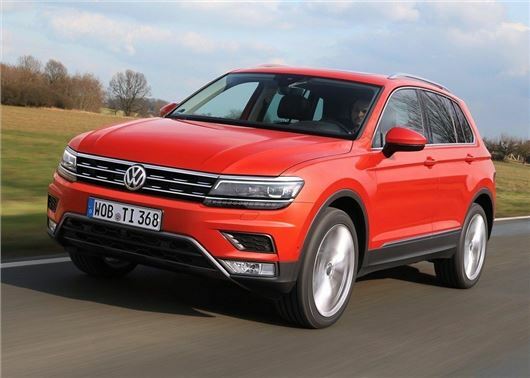 The Tiguan is built on the same modular platform as the Golf and gets a noticeable increase in dimensions; stretching 30mm wider and 60mm longer than the outgoing model. The ride height has also been lowered, while standard safety kit has been improved to include autonomous city braking, automatic post-collision braking and lane assistance. The is more bootspace than before, with a maximum of 1655 litres - up 145 - with the rear seats lowered. With the rear bench in place the Tiguan's boot will provide 615 litres of space and some powertrains will be capable of towing a braked 2500kg trailer. The engine range has been reworked with new four-cylinder diesel and petrol engines, with outputs varying from 125PS to 180PS. However, only the 2.0 petrol with 180PS and 2.0-litre diesel with 150PS will be available from the summer launch. The 180PS petrol – linked to four-wheel drive – will return a claimed 38.2mpg and 170g/km of CO2. The 150PS 2.0-litre diesels will make up the majority of sales and provide an official 125g/km and 58.9mpg when specified with front-wheel drive and a six-speed manual gearbox. All-wheel drive versions will provide an estimated 49.5mpg and 146g/km of CO2. The Tiguan will be offered in five trim levels - S, SE, SE Navigation, SEL and R-Line - but Volkswagen hasn't released any UK specs yet, so it is not yet clear what equipment comes as standard. Pricing for the 2.0 TDI with 150PS - linked to front-wheel drive - start at £25,530, although the entry-list price could fall to £22,500 when the 1.4 petrols become available later in the year.